It’s wonderful to welcome our man in London and Cunard’s President Mr. Peter Shanks. 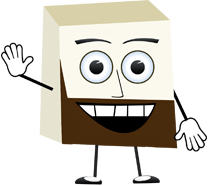 Here is a brilliantly told story which I know you will all enjoy. Each year I venture down to Australia and New Zealand to spend time on our ships as they reach the half way point of their world voyages. It is a long way from my front door, my family and my trusted Labrador – and I have to admit it was quite a daunting prospect to be away from the family and away from the office for such a long time. 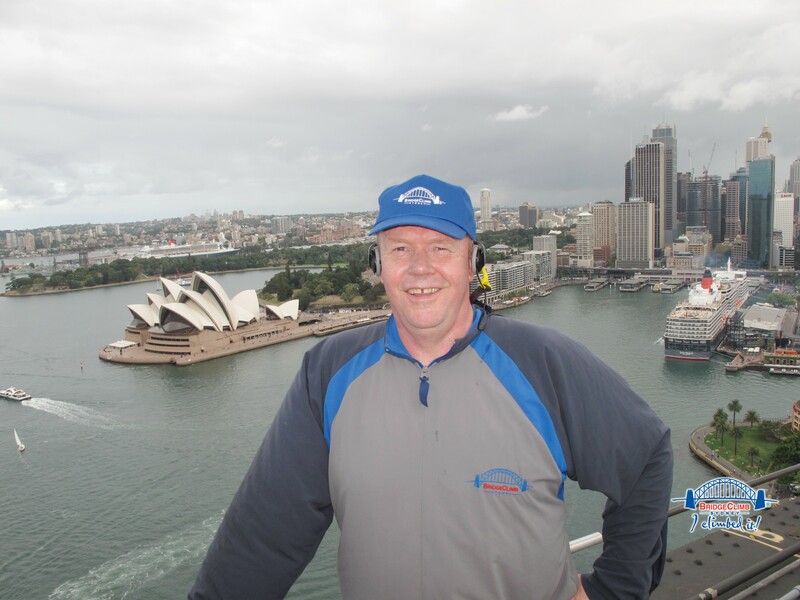 But I have to tell you – we have encountered some very moving moments down under on Queen Mary 2 and Queen Elizabeth and I would like to share some of those moments with you. Welcome home……After a 27 hour flight , and struggling to get to grips with a 13 hour time difference, I arrived onboard Queen Elizabeth in Auckland. I was greeted by our Hotel Manager who said ‘welcome home’ – after such a long journey and in the familiar surroundings of Queen Elizabeth I really did feel at home amongst my Cunard colleagues and loyal guests. It was a bust time in Auckland and Wellington – much interest with the local press, presentations to travel agents and the first highlight of the trip – the Queen Elizabeth World Voyage Dinner. 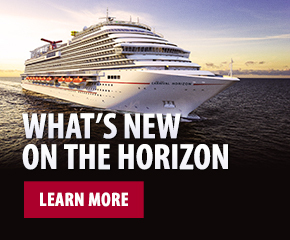 It’s a tradition – we take all of our full world voyagers out to dinner to thank them for coming with us. It was a marvelous evening – including a full New Zealand ‘Hakka’ to welcome our guests. 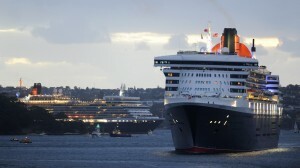 As Queen Elizabeth left Wellington I flew to Sydney to prepare for the arrival of our Two Queens. Oh Dear……….Quite an amusing moment on Sunday morning as I became a tourist and took a 2 hour Captain Cook’s two hour tour around Sydney Harbour. 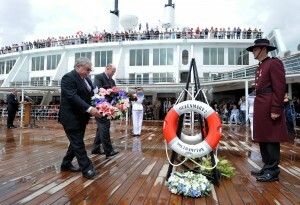 Turned out there were about 200 people on the boat – 199 Holland America guests and me. As much as I respect our sister cruise line , I could not helping seeing the funny side as the lady providing the harbor commentary spent most of the two hours telling all the Holland America customers about the pending arrival of Cunard Line and their Two Queens. So I kept my hat on, head down and enjoyed the irony of the moment. The magical arrival of Two Queens……..Fast forward to 0600 on Tuesday morning. I am standing on the steps of the Sydney Opera House surrounded by thousands of people. 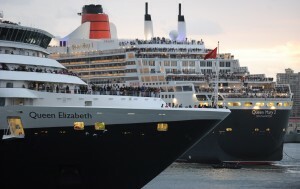 Some had paused on their morning jog, some had stopped by on their way to work – and all had come to see the arrival of Queen Mary 2 and Queen Elizabeth. There was a marvelous expectation in the air – where were they – would they be on time – would they come in together. I had every faith in our Captains. 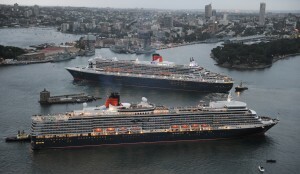 Then round the headland and into the incredible Sydney Harbour came Queen Mary 2. I have seen her so many times, but back came the goose pimples and all around me I could sense the excitement. But hang on a minute – where was Queen Elizabeth. I could not stand the suspense so I called a colleague on the Bridge of Queen Elizabeth – to be told ‘don’t panic we are just coming round the corner’. And round she came – the two ships approached Fort Denison, the sun came up, there were 9 news helicopters in the sky above us – and both ships were a wall of flashlight bulbs as over 4,600 Cunard guests were treated to a moment they would never forget – and I was the proudest person lucky enough to be standing on the steps of Sydney Opera House. After much whistle blowing – it was apparent that Cunard had arrived in Sydney and we were set for an interesting 24 hours. Teamwork …..I have written before about the special people we have at Cunard. 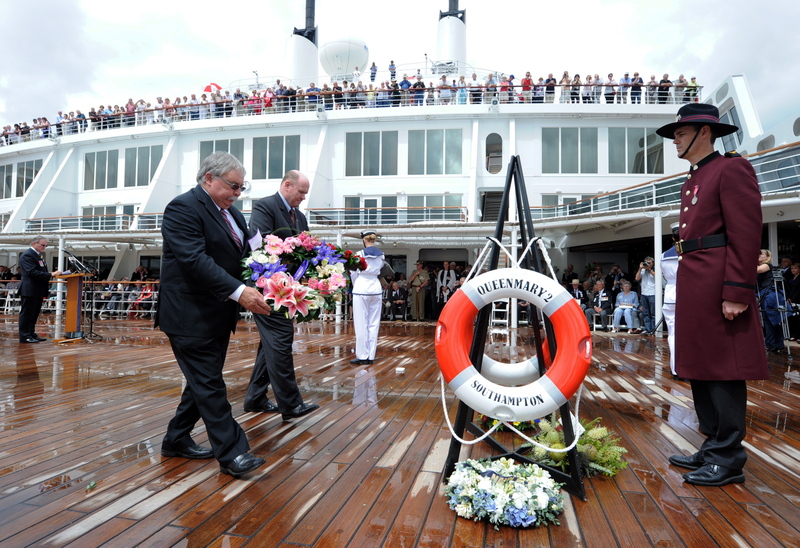 Last year I developed a special bond with many of the Queen Elizabeth’s ship’s company. Throughout the ship’s build and launch there were many people who worked their socks off. So – we all deserve a couple of hours off from time to time. 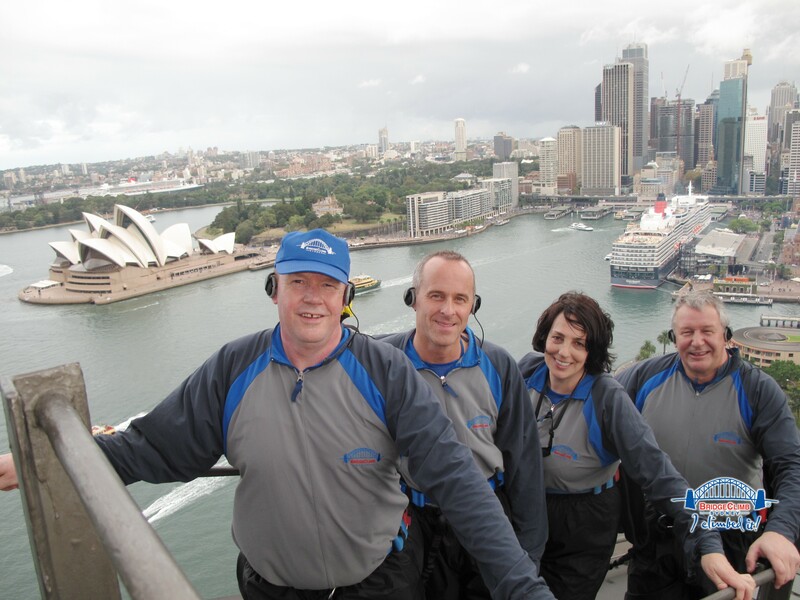 So that afternoon, the Hotel Manager, Chief Engineer, our Product Director and I decided to climb Sydney Harbour Bridge – why not. And as time was short – we did the ‘Fast Climb.’ If you have not done it – then please promise me that next time you are in Sydney you will if you are able to – it’s a fantastic experience. Believe it or not it was the first time that our Hotel Manager and Chief had gone ashore since leaving Southampton. 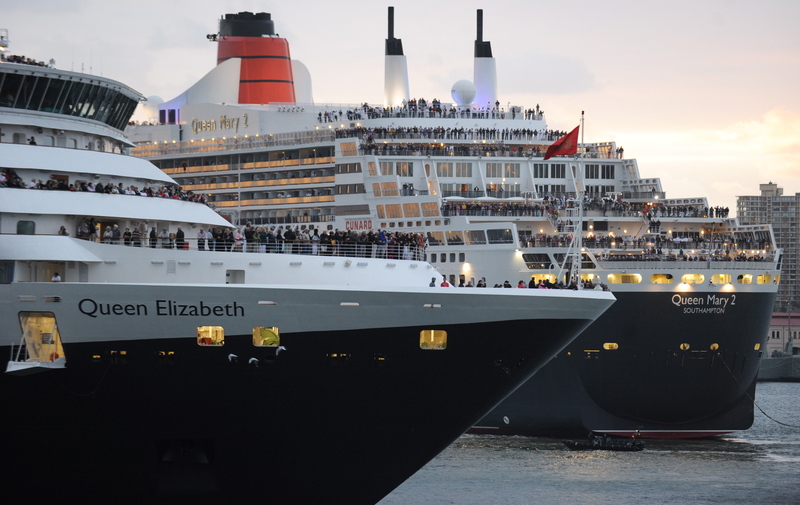 We had so much fun and on getting to the top we were able to see both Queen Elizabeth and Queen Mary 2 below us in the harbor. It was quite a sight – but actually what was uppermost in my mind was how fortunate I am to work with such talented at motivated people – across all levels on all of our ships. Some helpful perspective……..That evening back on Queen Elizabeth we hosted a special event for Lifehouse Foundation. They are a wonderful organization founded by Professor Chris O’Brien. He was a visionary cancer specialist who sadly died from cancer. We always like to support great causes and many people came to a special cocktail reception in the Garden Lounge on Queen Elizabeth. My day so far had been pretty exciting but as I listened to the speeches it sensibly brought me back down to earth – and was a very moving evening raising $25,000. If you do want to know more about them the please google ‘Lifehouse’ and see what you can do to help. We met on the aft deck with a view over Sydney Harbour Bridge. The Navy Band stood to attention, a Guard of Honour took their position and many hundreds of our passengers watched from the higher decks. We went on to lay wreath, provide a blessing, a hymn and a very moving Ode, Last Post and Rouse. Shortly after we sang the Australian and British National Anthems and as we gazed out into Sydney Harbour lost in reflection of the moment – into view came Queen Elizabeth as she sailed past on her way out of Sydney. Yes there were tears all round. Remarkable and Great Men…… A lovely picture below of one of the veterans alongside the wreaths. What is remarkable is that this chap in his mid-90’s brought with home the very kit bag and hat that he took up the Queen Mary gangway in 1941. I was so humbled, I was in the presence of a great and beautiful man and I shall not forget meeting Charles Edwards – and his many colleagues. The man who save Queen Mary…… Yes I am afraid there is more to this blog. In 1945 Cyril Butcher was serving in the air force flying 18 hour missions in Liberators out of Belfast, Northern Ireland. His task was to protect warships and convoys. Late in that day’s mission he spotted and attacked a U-Boat. He was unable to sink it and ran out of ammunition. As he flew on through a rain squall he was amazed to see he was right Over Queen Mary in mid-Atlantic. He flew low over the ship and used his radio to warn the Queen Mary of the U-Boat lying just 6 miles ahead. Queen Mary immediately altered course and avoided the risk. Cyril Butcher from then on was known as ‘The man who saved Queen Mary.’ And remarkably – at 92 years young – here he was standing next to me on Queen Mary 2. And as you can see from the picture he looks as fit as a fiddle. Amongst much camaraderie we treated the veterans to lunch in the Britannia Restaurant, Of course the tucker was a little better that they had last time onboard a Cunard Line. They told us stories of smuggling a kangaroo onboard, of drinking a little more beer on the ‘wet canteen’ that they should have, and of pretending to be a senior officer to grab a cabin rather than a bunk. So – we have certainly had a very interesting time down under. World Voyage Dinners, Press Conferences and Travel Agent Presentations, much time spent with our valued guests, the meeting of the Two Queens, valuable time spent meeting with the ship’s company and a bridge climbed – but as I prepare to fly home the highlight of my trip is set in stone – I met Charles Edwards and I met Cyril Butcher and I feel humbled, privileged and enriched for having done so.